IT Directors and Network Managers of K-12 school districts need to have a solid grasp on the E-rate process and plan carefully to take advantage of these funds. This article is written to assist IT Professionals and Administrators navigate the E-rate process and maximize the opportunity. E-rate is a federally funded program that provides significant discounts to assist K-12 schools and libraries to help fund telecommunications services and technology. It is administered by the Universal Service Administrative Company (USAC) under the direction of the Federal Communications Commission (FCC). The program determines which products and services are eligible for E-rate, and then determines your school’s discount level by the percentage of students in the district that qualify for free and reduced school lunches. As an example, if you purchased a $300k Wi-Fi deployment and your school falls into the highlighted category above, the E-rate program will cover 85% of that Wi-Fi deployment ($255k), and you will only be responsible for paying 15% of it ($45k). These discounts are significant, and it will be important for you to be aware of the guidelines throughout the process to be able to fully benefit. Each year, before the FCC Form 471 application filing window opens, the FCC releases an Eligible Services List (ESL) for the upcoming funding year. This list contains a description of the products and services that will be eligible for discounts, along with additional helpful information such as eligibility conditions for each category of service. To review this list, the ESL Glossary and Frequently Asked Questions (FAQs) before you file an FCC Form 470 to open your competitive bidding process so you know which services are eligible for the upcoming year. How to Navigate the E-rate Process and Avoid Costly Mistakes? The E-rate process, is a bit arduous, let's be honest. That is why it is so valuable to align with a partner that fully understands the process and has experience navigating the system. But, if you are going about the process alone, here is a helpful flowchart outlining the basic E-rate process. The first step of the process is to determine if the products and services your school needs are eligible, and if so, at what discount. The USAC Eligibility webpage is a good resource here. During the 28-day bidding process, you are not required to take any action, this is the part of the process that allows all service providers equal rights to responding. At the end of the bidding process, you and your team review the submitted bids and are required to respond to every vendor who submitted a bid. It is important to note that when evaluating bids, you must document the selection price with a bid score sheet. The price must be the primary factor affecting your decision. This particular caveat seems completely unreasonable, as other criteria including the experience of the service provider and their project management expertise should always be taken into consideration when selecting technology of any kind. Once a vendor is selected, sign the contracts and go to the next step. After you select and sign a contract, you will complete a Form 471 online to describe the services you are ordering, and from which vendor. At this point, the vendor is now allowed to enter into an engagement process with you on the Form 471. After you file your Form 471, along with the Item 21 attachments, the Program Integrity Assurance (PIA) will review the content of the form for completeness and accuracy. There is both an initial review and a final review, and the status can be tracked online. You have 15 days to respond to any PIA questions regarding your Form 471 submission (additional time can be requested). We have seen review processes take anywhere from 1-6 months, so be advised and plan for the possible delay. Once the PIA review process has been completed, USAC issues a Funding Commitment Decision Letter (FCDL), which contains USAC’s decisions on your funding request. If you disagree with the decision in the FCDL, you can appeal to USAC or the FCC. This letter contains important information for completing the rest of the of the application process, so it’s critical that you review it carefully. Once approval has been granted, begin discussing with your selected service provider the details involved in installing the equipment and starting the services. Be sure to review the contract with your service provider and determine whether it will be you or your service provider that will invoice USAC for the discounted amount of the cost of the services. Once services have started, you should be ready to file the FCC Form 486. 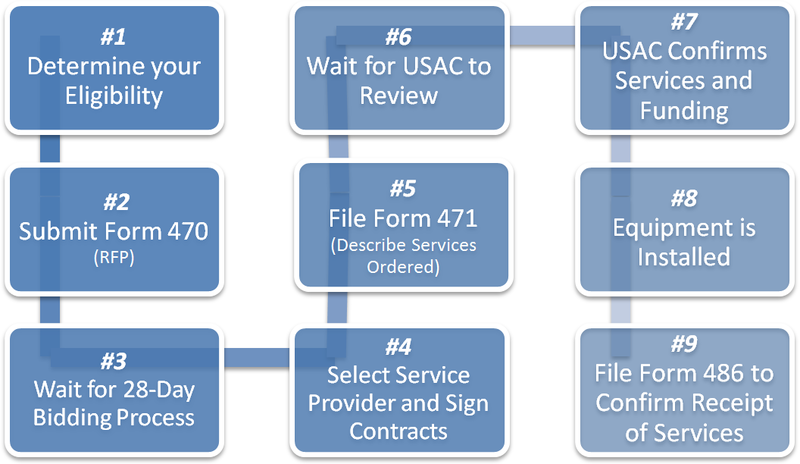 After equipment has been installed and your new services have started, your next step is to file a Form 486, which informs USAC that your services have started and invoicing can begin. Form 486 must be received and certified by USAC no later than 120 days after the service start date, or 120 days after the date of the FCDL, whichever is later. Filing late can result in a reduction in funding. What is the E-rate timeline? As seen in the timeline below, the most common time to file your Form 470 is October through January, but they can be filed as early as July 1. Form 471’s are then typically filed November through March 2016, and funding decisions are completed in July, August and September 2016. Equipment installations can begin as early as April 2016. The process outlined in this article can paint one of two pictures. Either the journey seems too daunting and not worth the time to go through all the red tape and hurdles. Or, the process seems well worth the time, if it results in refreshing outdated technology at a significant discount. Trust us, the later is the vision you should have. After several E-rate successes, Matrix Networks has proven the process works and the outcome can be revolutionizing for schools and libraries that are behind the times when it comes to basic network infrastructure and communication tools. Although we technically cannot get involved until after Step 5 (listed above), we hope this article serves as a resource to you and your team and we look forward to seeing your Form 470 Submissions and look forward to serving you in 2019.